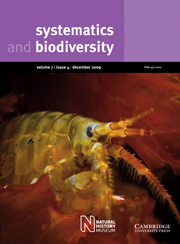 The genus Gammarus (Amphipoda) is one of the most speciose genera of Crustacea, yet much uncertainty remains concerning taxonomy and systematic relationships, particularly for brackish and marine forms. We used DNA barcode sequences from the mitochondrial cytochrome c oxidase I (COI) gene to probe the taxonomy of prominent members of marine and brackish water Gammarus of the North Atlantic, Baltic, Mediterranean and Black Seas. We investigated 16 putative Gammarus spp. at an average number of 9 specimens per species. This constitutes the most taxonomically and geographically comprehensive molecular study of marine Gammarus to date. Average between-species sequence divergence (26.8%) was much higher than intraspecific distances (0.8%), enabling clear molecular species identification and highlighting several possible misidentifications from previously published studies. Specimens of Gammarus aequicauda and G. insensibilis from the Black Sea were at least 14% distant from their putative conspecifics elsewhere. Placing these findings in a geographic context provides strong indication of cryptic speciation. Further, we detected phylogeographic splits in G. oceanicus and G. duebeni. Our analyses also suggest phylogenetic positioning of G. marinus with members of the genus Echinogammarus, thus confirming its classification as Echinogammarus marinus. We have demonstrated that comprehensive analyses of taxonomically complex groups using DNA barcodes can result in a diversity of complementary data on taxonomy, phylogeography and phylogenetics. The combination of these results, with further morphological and ecological data, will enable significant progress in our understanding of this ecologically important group of crustaceans.